Research and Development spending in Malta remained the third lowest in the EU in 2017, one of only eight member states registering a percentage below 1 per cent of GDP. In 2017, the highest R&D intensities were recorded in Sweden (3.33%) and Austria (3.16%), followed by Denmark (3.06%) and Germany (3.02%), all with R&D expenditure above 3% of GDP. Other countries have been making great inrouds, with 21 seeing their R&D intensity rise over the past decade. In Malta, it has remained unchanged at 0.55 per cent. Six other countries saw their intensity actually decrease. In 2017, the member states of the European Union (EU) together spent almost €320 billion on Research & Development (R&D). The R&D intensity, expenditure as a percentage of GDP, stood at 2.07 per cent in 2017, compared with 2.04 per cent in 2016. Ten years earlier (2007), R&D intensity was 1.77 per cent. 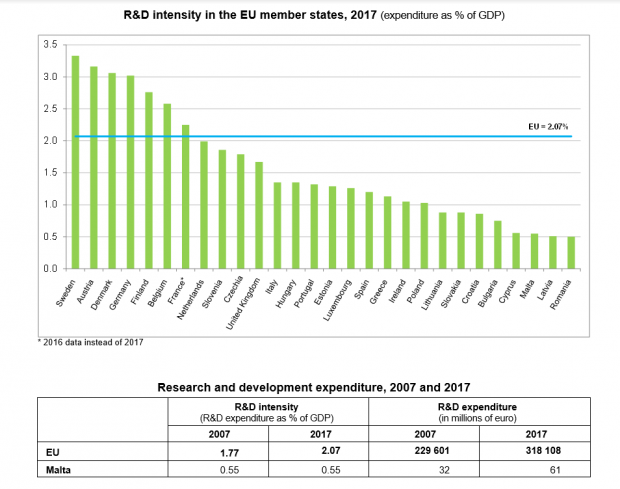 R&D is a major driver of innovation, and R&D expenditure and intensity are two of the key indicators used to monitor resources devoted to science and technology worldwide, Eurostat reported on Thursday.